When it comes to the operating room, we all know that disinfection is important, but we also know that human error can cause inconsistencies in preventing HAIs (hospital-acquired infections). HAIs cost the healthcare industry billions of dollars a year. More than 220,000 HAIs result in 8,500 to 12,000 deaths each year in Canada (and it’s increasing). 1 in 9 patients in Canadian hospitals get a healthcare associated infection. This is where the latest infection prevention technology in disinfecting operating rooms comes into play. UV sterilization, sometimes simply referred to as UV robots, complement the cleaning and disinfection process in the OR to kill bacteria, minimizing the spreading HAIs. What is UV sterilization for operating rooms? UV sterilization robots utilize a specific UV light (UVC) to kill germs and pathogens that may remain on surfaces after the manual cleaning and disinfecting process. There are two main types of UV light, which are then further separated into three sub categories. UV Mercury is the more traditional UV light source that uses an electric arc inside an ionized gas chamber, which then emits photons after the atoms decay, producing a steady stream of light. UV Xenon, on the other hand, releases pulses of energy (as opposed to a steady stream of light). After storing the electrical charge in a capacitator, the energy emits in millisecond pulses. This renders germs and pathogens unable to reproduce or repair, as the photons are more powerful. There are three subcategories of ultraviolet light. 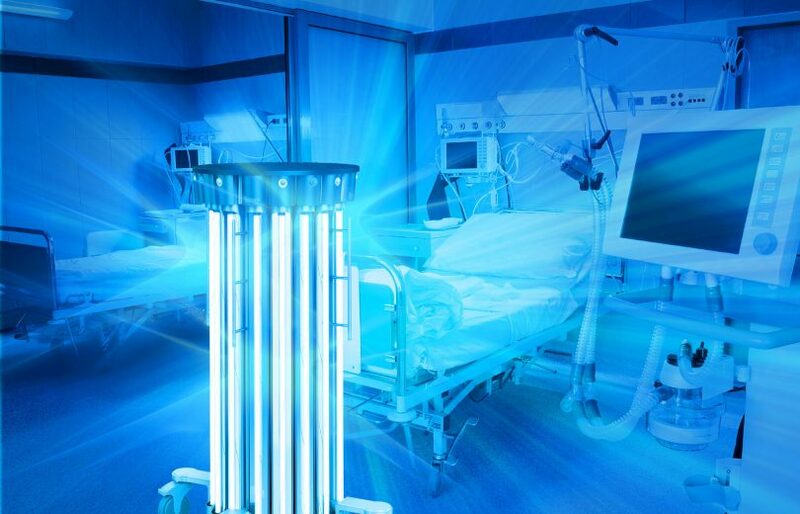 Of the three, UV-C is the most powerful and effective when it comes to killing pathogens in the operating room. Test after test has conclusively determined that xenon powered ultraviolet light is more effective and efficient at disinfecting the OR. On average, a xenon UV robot will complete disinfection in around 10 times less the amount of time. For example, a mercury robot’s 60 minutes would be approximately 6 minutes for a xenon robot. Are UV robots a replacement for manual cleaning and disinfection? Automated room sanitizing technology, like mobile UV robots, augments the terminal cleaning process. Unfortunately, no UV robot at this time can clean up soils and liquids; this still has to be done manually. As well, if there were an object left on top of a table, what’s underneath would not get disinfected by the ultraviolet light. However, humans are not perfect and things get missed. Stuff happens. That’s where UVC light ensures that everything has reached the applicable level of disinfection. Can the UV robot disinfect shadowy areas? This all depends on the type of robot and the strength of the light. If the UV robot has a strong enough light source, the light will essentially bounce off other surfaces and reach into shadow areas. How many UV robots do I need to disinfect each room at any given time? Financially, it makes sense to have no more than one robot in use in any given room at any given time. Depending on the room layout and size, the UV robot may have to run through its cycle more than once. If so, place the robot in multiple positions and run the cycle each time. Normally, the robot would have a maximum of two positions for one room. Note: There are currently two models on the market that are powerful enough to promote a ‘Single-cycle, whole-room’ disinfection treatments. Is UVC light dangerous to humans? UVC has been known to cause red skin (erythms) and painful eye infection (conjunctivitis) to humans after prolonged exposure or in the case of a higher radiation dosage. Can cleaning staff be in the room while the UV robot is on? No. No one should be in the room while the UV robot is on. 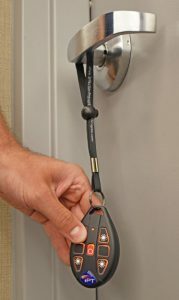 How do the UV robots prevent someone from accidentally entering a room while it is on? There are several methods employed by differing brands, although not every brand will have all of them. When one of the sensors or infrared beams engages, the robot automatically shuts off. Not all brands are the same. Some will only allow up to a maximum of three sensors, while others may have up to four. UV robot operators have their own pin code that prevents unauthorized starting of a disinfection treatment. On the hand control, the operator needs to verify a list of safety items before a disinfection treatment can be started. Will it add more time to the cleaning and disinfecting of a room? The short, yet needing-more-explanation, answer is yes. Each room will present its own challenges and opportunities for efficiencies. Managing the sequence and robot deployment based on room layout is key to mitigating the effects of challenges. Using a patient room as an example, environmental services could first clean the washroom, and then initiate UV treatment in there, while going on to clean the rest of the room. If most UV robots use UVC xenon light, are they all the same strength? Several factors affect the strength of each brand and model. Electrical energy is where everything starts. Some brands use a 15 amp circuit, while others draw from 20 amp electrical outlets thereby providing an immediate 33% power advantage over the 15 amp. Some brands will incorporate a power booster feature that essentially is a fast charge for the power system. This provides even more electrical energy to power the high output UV lamps, resulting in shorter disinfection times. Different bulbs from different manufacturers will result in varying bulb life. Generally, we’ve seen bulb life in the area of 8,000 hours to 16,000 hours. The other factor when weighting over the cost of ownership is how many bulbs each robot has. Ultraviolet sterilization is the newest infection prevention trend, and one that appears to be of increasing importance. The last thing patients want on their mind is if they are going to be worse off after being in a hospital. However, with HAI rates on the rise, there are more possibilities now than ever before. Test after test, and study after study, has shown that UV disinfection is the most advanced weapon available on the market today. Meditek is the exclusive distributor in Western Canada for Skytron’s UV robots, the IPT 1140 SENTRY, IPT 2280 SYNDICATE, and IPT 3200 MAX. The IPT 3200 is the most powerful germ-killing UV robot in the world. Contact us today to learn more about which model would be the best fit for your needs. Has your company ever researched the UV robots for applications in schools? I work as an operating room tech and was watching the news this morning and they were talking about the flu season being really bad and schools getting shut down because there were so many staff and students calling out. I thought what if schools had a UV robot in the rooms after hours to help with disinfection. Hello Eric. Thanks for your comment. As we deal strictly in healthcare, we haven’t had the chance to do any research for school applications. However, now that you mention it, schools are considered to be a major breeding ground for bacteria and viruses, so a UV robot would be a potential way to help combat that. This year, at least in Winnipeg, the flu has been exceptionally bad. Also, it’s important to remember that the UV robots work in conjunction with manual cleaning. So if the surfaces in the classroom are not getting manually cleaned, the effect would not have as much an impact. What is the cost involved, including purchase cost and maintainable cost?